What if I added the before the title and that would take you to the first unread post while clicking the thread would take you to the first post of the thread? Done. Let me know how it works out. 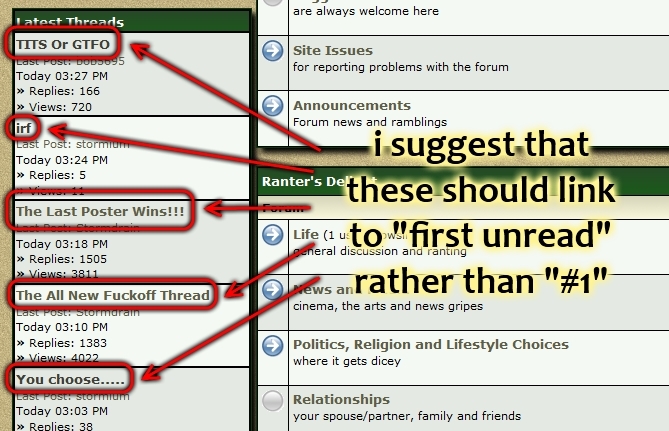 instead of the arrow being in front of the thread name, is it possible to move it to the second line or behind the thread name so it does not provide default first thread skipping for inexperienced forum users? Inexperienced users will click the thread title or the labelled 'Last Post' link before the click the jump icon. The $gotounread icon defaults to this position I have just maintained the MyBB setup.